Through this implementation of Moodle we offer self-paced B2B sales training. If you are interested in taking any of the courses featured here, please use the links to visit the sign up page on our main site. For more about SalesSense, visit this page. How to find and engage more of the right prospects at the right time. Sales prospecting training for business development. The 21st century has brought huge changes to selling yet many old principles remain the same. Getting the attention of executives and initiating a meaningful business dialogue remains the most challenging sales task. Sales prospecting training integrates the old ways with the new methods. The ability to make new connections when the time is right is the most sought after selling skill. Nothing else presents such awkward obstacles, yet there are tried and tested methods for getting the attention of decision makers, engaging them in a business conversation, and setting up sales calls. Take this learning programme to acquire today's best practices, methods, and habits and gain the most salable skill in the commercial world. Business development salespeople tasked with winning new business; account managers who need more access to senior managers and directors, and Managers who want to develop their teams sales prospecting skills. 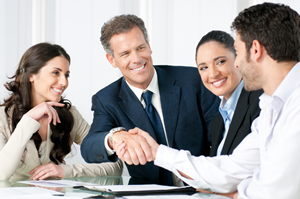 B2B Sales Training Course - Develop sales skills for business to business sales performance. Get up to speed fast with B2B sales training. Study the essential skills, habits, and methods of sales professionals and discover the secrets of high earning salespeople. Learn how to find the right customers, add unique value, and help customers succeed. Establish strategic supplier status and become a customer's trusted advisor. Take this B2B sales training course to develop professional sales skills and increase sales performance. New business to business salespeople and those with limited experience or previous B2B sales training who want to launch or re-establish a business to business sales career. Salespeople who are transitioning to a business sales role and those interested in learning professional selling skills. Business development management training course for design and management of business growth plans and development initiatives. Acquire a comprehensive set of new tools and skills for business development management and sales growth. Job descriptions for business development managers vary widely yet almost all are focused on producing new business from new customers. This course equips people in BDM roles to develop and execute business development strategy. If you need to set business development strategy, find new customers, engage business decision makers, or lead marketing initiatives, Business Development Management training develops the right skills, teaches effective methods, and provides the right tools. Business Development Managers, Business Development Directors, and General Managers with new business responsibility. If you lead, manage, or direct new customer acquisition, this course expands the tools, methods and practices you can use to to bring in new business.